PopCap has laid off Plants vs. Zombies creator George Fan, the day after announcing a sequel to the game. You may not know George Fan by name, but I guarantee you know his work. His is the brain behind Plants vs. Zombies, one of the most wildly successful "casual" games of all time, a tower defense title that began life in 2009 as a fairly typical PopCap PC release and is now available on pretty much every platform known to man. Sunflowers and zombies have become PopCap's most instantly recognizable flagship characters, and after releasing no less than three separate retail collector's editions, the studio finally announced on Monday that a sequel is in development. Sadly, and kind of amazingly, the man who got the ball rolling won't be around to help with the follow-up. PopCap confirmed yesterday that it was in the process of laying off approximately 50 employees, and while it didn't name names at the time, included among them is Senior Game Designer and Plants vs. Zombies creator George Fan. Any layoffs are regrettable, but cutting Fan from the lineup is particularly inexplicable. 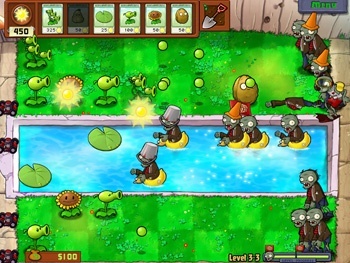 As Susan Arendt noted in a 2009 interview, Plants vs. Zombies was his baby from start to finish. And he was hardly a one-hit wonder, having also designed the 2002 PopCap hit Insaniquarium, which actually helped inspire Plants vs. Zombies. The timing is ugly, coming on the heels of the Plants vs. Zombies 2 announcement as it does, and the specter of EA, which acquired PopCap a little over a year ago for $750 million, also looms large. PopCap claimed that EA had nothing to do with the layoffs and that without its financial support the cuts may have been even deeper, but that still leaves a couple of pretty big questions unanswered. Why George? And why now? Business is business, but this just does not look good.